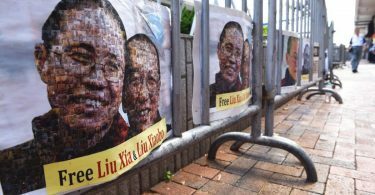 A sit-in organised by the Alliance calling for ailing Chinese dissident Liu Xiaobo to be released is continuing into its second day. 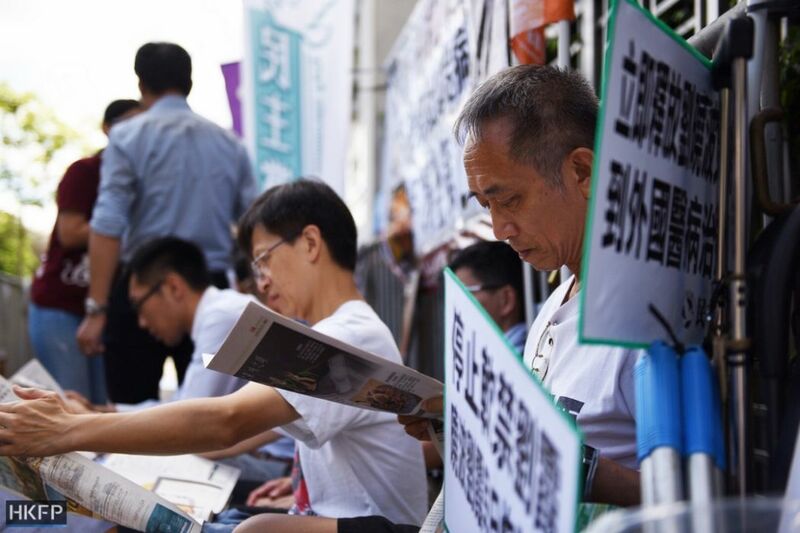 Around 10 people were sat with banners and placards outside the China Liaison Office – Beijing’s official organ in Hong Kong – on Tuesday morning. A similar number of police officers stood nearby. 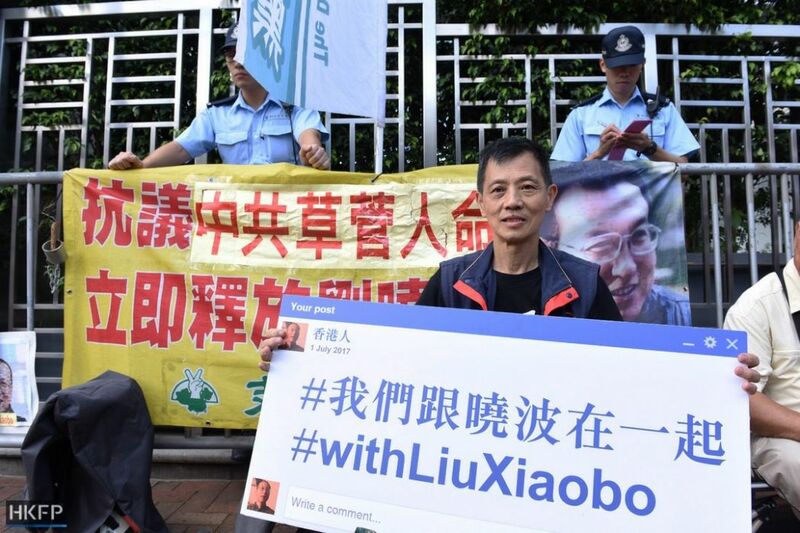 Liu’s family and supporters, along with some foreign governments, have called for Liu’s release since he was revealed to have been transferred from prison to a hospital with terminal liver cancer in late June. The Nobel Peace Prize winner was sentenced to 11 years in prison after he co-wrote Charter ’08, a manifesto calling for democratic reform in China. 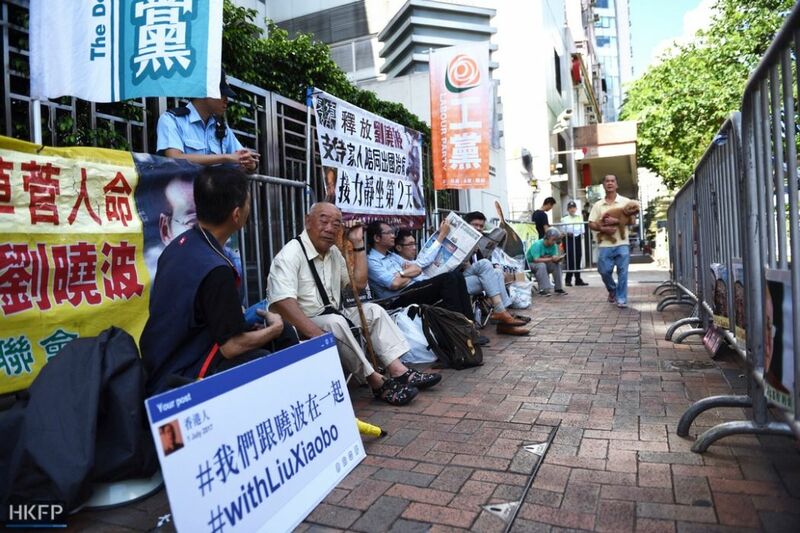 Protesters sit in front of the China Liaison Office on Tuesday. Photo: HKFP/Catherine Lai. Beijing considers Liu a convicted criminal and accuses foreign governments who voice support for him of meddling in China’s internal affairs. Two of the protesters sat in front of the office in the Western district through the night, while others arrived or returned in the morning. 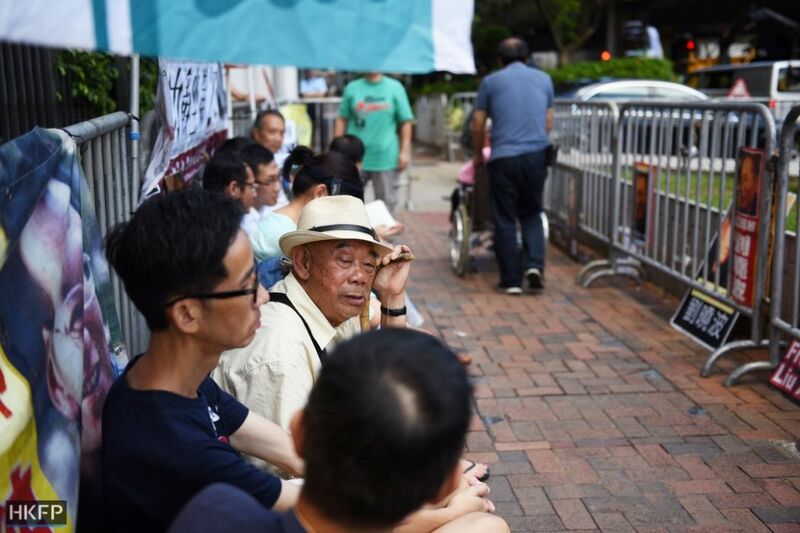 They vow to continue the “relay protest,” taking turns to sit at the Liaison Office until Liu is allowed to leave China for treatment. 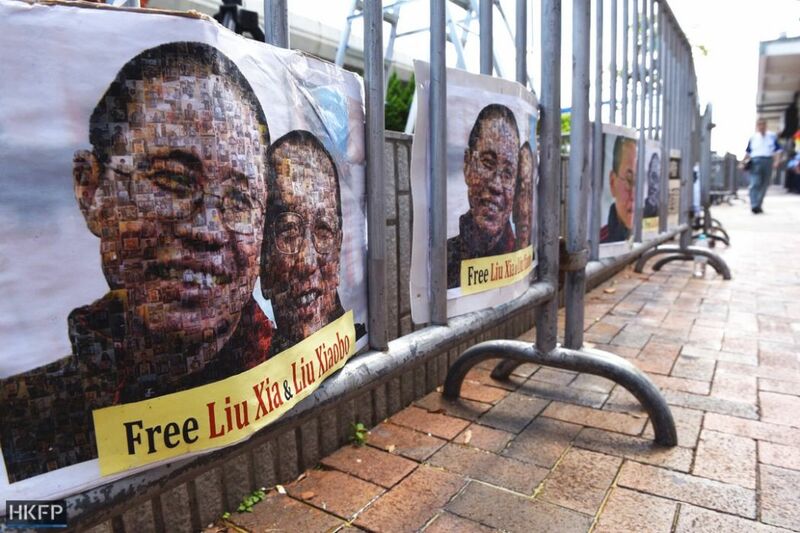 “I think it’s a critical juncture now – we must take action to call on the Chinese government to make a decision to free Liu Xiaobo, and act according to his family’s wishes to let him leave the country for treatment,” he said. 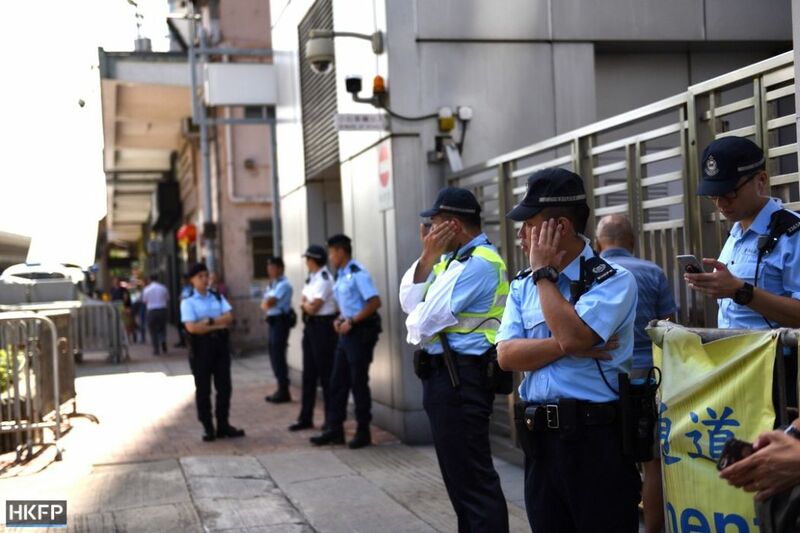 Police in front of the China Liaison Office on Tuesday. Photo: HKFP/Catherine Lai. 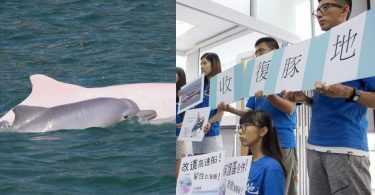 About 40 people attended the relay sit-in as it began at 6pm on Monday, according to Ming Pao. Close to 100 people attended between the time the protest started and Tuesday morning, Tsoi told HKFP. 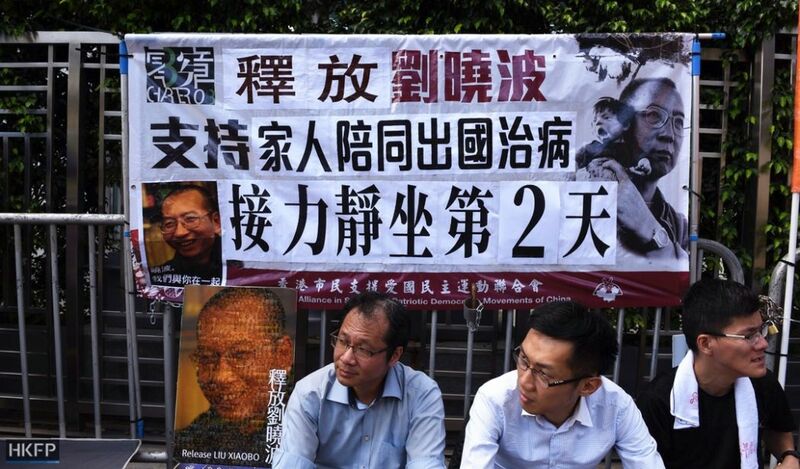 Posters in front of the China Liaison Office on Tuesday. Photo: HKFP/Catherine Lai. 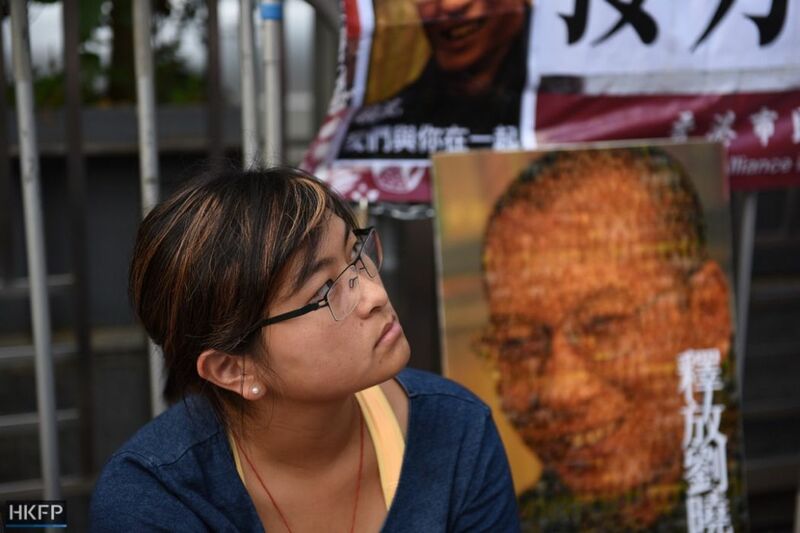 Nicole Wong sits in front of the China Liaison Office on Tuesday. Photo: HKFP/Catherine Lai. Nicole Wong, an 18-year-old student, attended the sit-in with her mother, Susan. She told HKFP she would stay as long as she can at the protest on Tuesday, and hopes China will forget political considerations, regard him as a human being and respect his wish to go abroad. Susan said Liu was a peaceful and patriotic intellectual, and compared him to Aung San Suu Kyi and Nelson Mandela. She said she respected Liu because he put himself in danger by choosing to return to China from Columbia University, where he was working, during the Tiananmen Square protests in 1989. Liu helped broker a peaceful exit of the last student protesters left in the square as the authorities moved in. Hundreds, perhaps thousands, of demonstrators were killed.